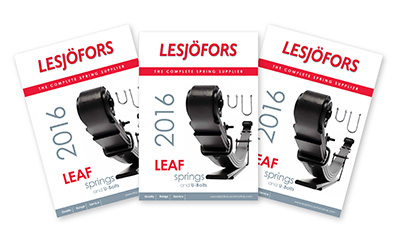 11/03/2016 Lesjöfors are delighted to announce the launch of their new 2016 leaf springs catalogue. Commonly used in the suspension systems of 4WD vehicles, light commercials, pick-ups, and some passenger cars; leaf springs remain a key suspension component and a profitable aftermarket product. Featuring over 250 parts covering more than 70 different models, the new catalogue contains 13 brand new leaf springs, including a replacement Mercedes Sprinter front leaf spring made from a fibreglass-resin composite. Composite leaf springs offer a weight saving compared to traditional steel leaf springs, allowing for a slightly increased payload. Additionally, composite springs are immune to corrosion and significantly more durable than steel springs. Where a composite leaf spring is used as OE, Lesjöfors will always endeavour to offer a composite replacement spring. In addition to leaf springs, Lesjöfors offer a universal range of 38 U-bolts - all supplied complete with nuts - designed to cover the vast majority of standard and heavy-duty applications. For convenience, leaf springs are listed together with their corresponding U-bolts. All Lesjöfors leaf springs are supplied with a 1-year manufacturer’s warranty and guaranteed to match or exceed OE standards, providing complete peace of mind and allowing fitment by authorised workshops without warranty restrictions.